A record 26 international players were selected in NBA Draft 2016 presented by State Farm®, surpassing the previous record of 21 set in 2003. A record 14 international players were selected in the first round, and a record-tying 12 international players were selected in the second round. Below please find a list of the international players selected in the Draft, along with a few facts and figures about the global reach of the Draft and international players in the NBA. Ben Simmons (Australia) was selected 1st overall by the Philadelphia 76ers, joining Kyrie Irving (2011) and Andrew Bogut (2005) as the only Australian players ever selected 1st overall in the NBA Draft. There were a record-tying 8 Australians on 2015-16 opening night NBA rosters. Dragan Bender (Croatia) was selected 4th overall by the Phoenix Suns, becoming the highest drafted Croatian player ever. Bender participated in the NBA and FIBA’s first annual Basketball without Borders (BWB) Global Camp during NBA All-Star 2015 in New York City. There were 5 Croatians on 2015-16 opening night NBA rosters. Buddy Hield (Bahamas) was selected 6th overall by the New Orleans Pelicans, becoming the highest drafted Bahamian player since Mychal Thompson, who was selected 1st overall in the 1978 NBA Draft. Jamal Murray (Canada) was selected 7th overall by the Denver Nuggets, becoming the highest drafted Canadian player since Andrew Wiggins, who was selected 1st overall in the 2014 NBA Draft. Murray participated in the NBA and FIBA’s first annual Basketball without Borders (BWB) Global Camp during NBA All-Star 2015 in New York City. There were a record-tying 12 Canadians on 2015-16 opening night NBA rosters, more than any country outside the U.S. for the second consecutive year. Jakob Poeltl (Austria) was selected 9th overall by the Toronto Raptors, becoming the first Austrian player in NBA history. The Toronto Raptors led the league with seven international players on 2015-16 opening night NBA rosters. Thon Maker (South Sudan/Australia) was selected 10th overall by the Milwaukee Bucks, becoming the fourth NBA player ever from what is now South Sudan, joining Deng Gai (undrafted in the 2005 NBA Draft), Luol Deng (selected 7th overall in the 2004 NBA Draft), and Manute Bol (selected 31st overall in the 1985 NBA Draft). Maker participated in the second annual Basketball without Borders (BWB) Global Camp during NBA All-Star 2016 in Toronto. He also participated in BWB Americas 2015 in Santo Domingo, Dominican Republic. There were a record 10 African players on 2015-16 opening night NBA rosters. Georgios Papagiannis (Greece) was selected 13th overall by the Phoenix Suns, becoming the highest drafted Greek player ever. Juan Hernangomez (Spain) was selected 15th overall by the Denver Nuggets, becoming the highest drafted Spanish player since Ricky Rubio, who was selected 5th overall in the 2009 NBA Draft. There were 5 Spanish players on 2015-16 opening night NBA rosters. Guerschon Yabusele (France) was selected 16th overall by the Boston Celtics, becoming the highest drafted French player since Mickael Pietrus, who was selected 11th overall in the 2003 NBA Draft. There were 10 French players on 2015-16 opening night NBA rosters. Ante Zizic (Croatia) was selected 23rd overall by the Boston Celtics, becoming the second Croatian player selected in the first round of the 2016 NBA Draft. Timothe Luwawu-Cabarrot (France) was selected 24th overall by the Philadelphia 76ers, becoming the second French player selected in the first round of the 2016 NBA Draft. Furkan Korkmaz (Turkey) was selected 26th overall by the Philadelphia 76ers, becoming the highest drafted Turkish player since Enes Kanter, who was selected 3rd overall in the 2011 NBA Draft. There were 3 Turkish players on 2015-16 opening night NBA rosters. Pascal Siakam (Cameroon) was selected 27th overall by the Toronto Raptors, becoming the highest drafted Cameroonian player since Joel Embiid, who was selected 3rd overall in the 2014 NBA Draft. Siakam participated in the NBA and FIBA’s Basketball without Borders (BWB) Africa Camp in 2012 in Johannesburg, South Africa. Skal Labissiere (Haiti) was selected 28th overall by the Phoenix Suns, becoming the highest drafted Haitian player since Samuel Dalembert, who was selected 26th overall in the 2001 NBA Draft. Ivica Zubac (Croatia) was selected 32nd overall by the Los Angeles Lakers, becoming the third Croatian player selected in the 2016 NBA Draft. Cheick Diallo (Mali) was selected 33rd overall by the L.A. Clippers, becoming the highest drafted player ever from Mali. Rade Zagorac (Serbia) was selected 35th overall by the Boston Celtics, becoming the highest drafted Serbian player since Nikola Milutinov, who was selected 26th overall in the 2015 NBA Draft. David Michineau (France) was selected 39th overall by the New Orleans Pelicans, becoming the third French player selected in the 2016 NBA Draft. Zhou Qi (China) was selected 43rd overall by the Houston Rockets, becoming the highest drafted Chinese player since Sun Yue, who was selected 40th overall in the 2007 NBA Draft. Isaia Cordinier (France) was selected 44th overall by the Atlanta Hawks, becoming fourth French player selected in the 2016 NBA Draft. Paul Zipser (Germany) was selected 48th overall by the Chicago Bulls, becoming the highest drafted German player since Dennis Schroder, who was selected 17th overall in the 2013 NBA Draft. 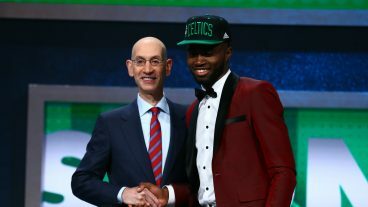 Ben Bentil (Ghana) was selected 51st overall by the Boston Celtics, becoming the first Ghanaian-born player in NBA history. Joel Bolomboy (Ukraine) was selected 52nd overall by the Utah Jazz, becoming the highest drafted Ukrainian-born player since Alex Len, who was selected 5th overall in the 2013 NBA Draft. Petr Cornelie (France) was selected 53rd overall by the Denver Nuggets, becoming the fifth French player selected in the 2016 NBA Draft. Wang Zhelin (China) was selected 57th overall by the Memphis Grizzlies, becoming the second Chinese player selected in the 2016 NBA Draft. Abdel Nader (Egypt) was selected 58th overall by the Boston Celtics, becoming the highest drafted Egyptian player since Alaa Abdelnaby, who was selected 25th overall in the 1990 NBA Draft. NBA Draft 2016 presented by State Farm® reached fans in 215 countries and territories. There were 100 international players from 37 countries and territories on 2015-16 opening night NBA rosters, marking the second consecutive year that opening night rosters featured at least 100 international players. For the second consecutive year, all 30 NBA teams featured at least one international player on 2015-16 opening night NBA rosters.